The adventure began at the Singapore General Hospital. The nurse asked me to push my face into a plastic and metal contraption with two eye-holes and a chin rest. Once in position, my eyes each felt a puff of compressed air. With that, the nurse obtained precise measurements of the hydrostatic pressure of the vitreous fluid in my eyeballs. A second nurse came with some special eye drops. Instead of soothing the eyes, they stung, forcing me to clench shut my eyelids like clams. When I opened them again, I saw a blur of walls and doors. The liquid had dilated my pupils like the aperture of a camera lens. I moved my palms slowly towards my face and discovered that they snapped into sharp focus at a distance of 24.3 centimeters, and immediately went murky again as they continued towards my face. There was no time to lose. Miss X whisked me into Room 7, where Dr. Y sat ready behind what they call a “binocular slit lamp”. Come, place your eye here, he said, as if conducting a pagan rite, and I saw a thin, very bright incandescent vertical line, the kind of singularity you encounter when you time-travel or go to heaven. My retina sensed the thin bright vertical line scanning it, moving towards the left, and then the right. Peering through small magnifying lenses mounted in metal rings with numerals engraved on them, Dr. Y observed the inner sanctum of my eyeball, a spherical baroque fresco of dendritic networks of nutrient-rich capillaries. My eyeballs passed the test with flying colours. I qualified for the next and final round, which would take me to the headquarters of the National Environment Agency. The big day came, and I dressed up for the occasion: ripped denim bermudas, Teva beach sandals and a T-shirt emblazoned with the 1965 front page of The Straits Times headlined Singapore is Out. When I got there, the air was tense. There were other people. They were all in long trousers and collared shirts and shoes. They looked like medical students, foreign construction workers, middle-aged laboratory technicians, poring over notes printed on A4-sized paper. It was a fine tropical afternoon and I decided that the best thing to do was to watch the palm trees lilting in the breeze and finish off the rest of my McDonald’s Filet-O-Fish, which was being squashed in my canvas bag. Nevertheless, I was standing in the foyer with 25 floors of government weighing down on me. When the Environment Building went up in the 80s, it was quite a statement. Presently an NEA official appeared and asked everyone to follow him. We were led to a meeting room on the third floor that moonlighted as a store for radiation monitoring equipment. The official gave out multiple-choice optical answer sheets and 2b pencils. I’ll be out in 15 minutes, I thought to myself. The education system had trained me well for this high school stuff. But when I saw the question paper, I had a shock. Fifty questions! I had imagined 25. I had seriously underestimated the scale of this. It was strenuous, although I had read through the notes three times. The questions were peppered with broken english and ambiguous phrases. And then, after just half an hour, one of the candidates finished and left! I was beaten to first place. It took me almost an hour. I was second to the finish line. Not too bad after all. The rest were still buried in the test while I handed in my papers and walked to freedom. A week later I received an email from NEA. It didn’t say whether I passed or not, but I knew I did. Attached to the email was my N3 licence. I was now qualified to operate high-powered Class 3b lasers, just one step below those used in weapons of mass destruction. Air-mounting coconut stamps unstained for confocal microscopy, using my bed as a laboratory bench in the early hours of the morning. A little seasoning with fluorescent dye would give the best results in fluorescence mode (see Jang et al. 1992), but this cannot be done on conservation material. The coverslips were taped down using 3M Magic Tape. This ensured that the stamps did not move or curl during scanning. There was no contact between the tape and the stamp. The Nikon Ti2-E is a monster of an upside-down microscope, crowned by the towering black edifice of the Nikon A1+ confocal module, festooned with auxiliary equipment like the superstructure of a battleship. On the main deck is a massive cluster of swiveling objective lenses that point towards the sky like the 18-inch guns of the Yamato. 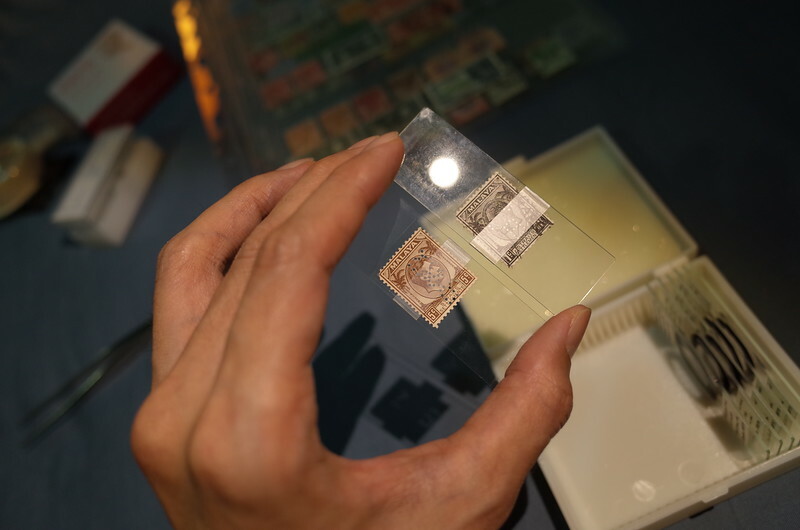 A confocal microscope maps the surface of a postage stamp with a moving laser, not unlike a LiDAR remote-sensing aircraft mapping the topography of a tropical forest canopy, or the laser ranging altimetry of the surface of the moon by the NASA Clementine spacecraft. 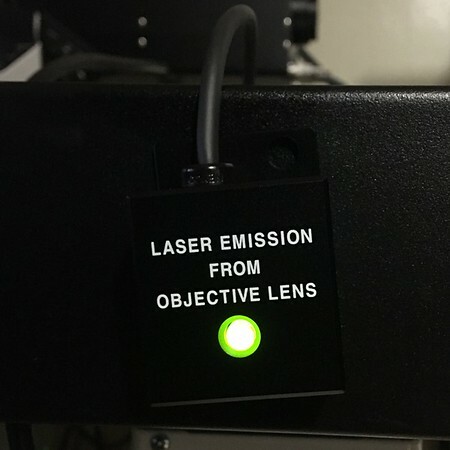 Two kinds of signal can be recorded from the microscope specimen—the fluorescence of the excited molecules and the laser reflected back from the surface. I found the latter more effective on the coconut definitives, as the printed and unprinted areas often differed greatly in fluorescence. 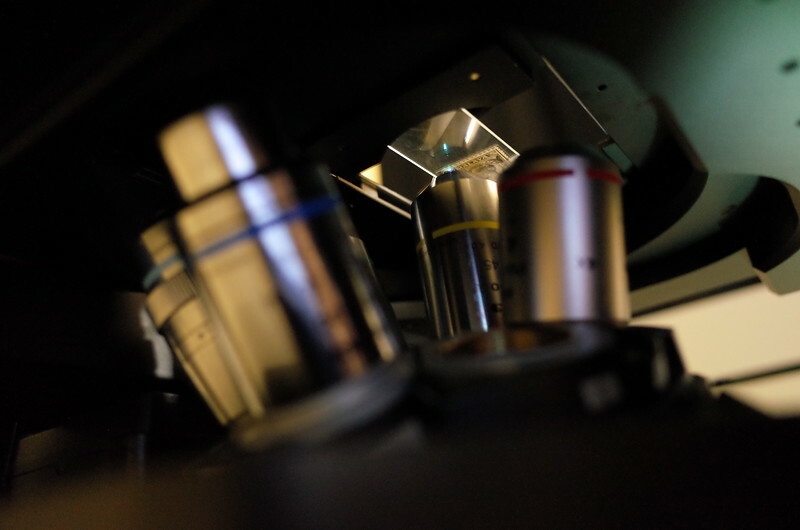 The optical system of a confocal microscope uses a pinhole to exclude out-of-focus light, yielding a sharp image on a very narrow plane of focus, or optical section. By obtaining many closely spaced sections along the optical axis, the stamp surface can be reconstructed in three dimensions. As lasers are monochromatic, confocal microscopy conveniently avoids chromatic aberrations. Guns of the battleship Yamato. Bombarding the molecules of the Universal Coconut Duty Plate with gallium aluminium nitride laser via the 10× plan-apochromatic λ objective. The optics are coated with multiple layers of crystallized nanoparticles that suppress internal reflections. I am grateful to Ernest Cheah, Clement Khaw and Benedict Sim for discussions and technical assistance, and to the Nikon Imaging Centre at the Singapore Bioimaging Consortium for the facilities that made this research possible.